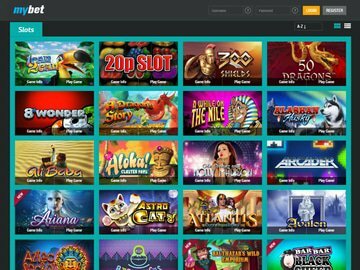 Below you will find a list of all the Mybet Casino bonuses - offered to new players. The right side offers a casino overview (click to scroll through the images). Mybet is a virtual sportsbook that offers up to 17,000 bets on sporting events across the globe. In addition to the sports betting portal, players have unrestricted access to a Microgaming Quickfire stocked online casino, a live dealer site, a poker room and a 'Games' section featuring Net Entertainment free spins slots, table games and video poker variations. The cross-channel gambling destination is operated by Personal Exchange International Limited and owned by a publicly listed company in Germany, Mybet Holding SE. Mobile gamblers have the entire betting portfolio at their fingertips optimised for iPad, iPhone and Android handheld devices. As one of the largest sports, politics and lifestyle betting sites on the mobile and online platforms, Mybet is comparatively well known in Canada. A cross section of gambling opportunities has prompted plenty of players north of the Niagara to search for no deposit Mybet bonuses. Despite a Euro-centric player base, football fans, in particular, from Toronto, Quebec, Montreal and Calgary are joining the community as well. Apart from offering incomparable odds, the site also supports both official languages, making it a great destination for Franco-Canadian too. 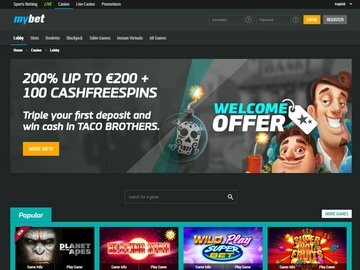 The key Mybet bonus is aimed at new bettors and comprises a 25% cash match on the first deposit, up to â‚¬50. As the free cash is automatically credited to your account, there is no need to enter a coupon or bonus code onsite. A minimum deposit of â‚¬5 and a turn over of 1 x the deposit and 5 x the bonus within 60 days unlocks the new player reward. There are always worthwhile promotions on the go to prompt punters to wager more frequently. Typical bonus code free incentives include top ups on winnings, better odds on the top football leagues and free cash bonuses on specified events within a game, such a red cards and multiple goals by a single player. An ongoing offer is the daily Lucky Number promotion. If the last two digits on your losing bet slip match the numbers displayed on the ball, you'll get your stake back, on the house. As most promotions are dedicated to a particular game or sports event, an identifying coupon or bonus code is no longer required. Unfortunately, no deposit bonuses are in short supply. Mybet sportsbook is fuelled by proprietary software that offers an advanced betting experience. Highlights include a wide and varied bet range on global sporting events, live in-play betting functionality and a single account solution. Bet types vary from straight and single bets to combination bets and the user friendly virtual bet slip is designed for dummies. Apart from the actual wagers, the virtual bookie provides a plethora of valuable information such as background information, statistics and tips. No download is required and the software is available in English, French, German, Spanish, Greek, Turkish and Swedish. Mybet mobile offers thousands of bets on your smartphone or tablet. The mobile app is fast, user friendly and easy to navigate and is compatible with latest generation iPads, iPhones and Android devices. A single account enables effortless access to all the gambling channels and you'll discover exactly the same markets and odds featured online. Wagers are accepted in EUR only and you can fund your account quickly and easily via bank transfer, Visa, Mastercard, Skrill, Neteller, Paysafecard, Giropay, PayPal, QiWi, TrustPay and uKash, some of which are readily available to Canadian punters. Transactions are protected by VeriSign's authentication infrastructure and the site uses 128-bit SSL encryption and is Thwate certified secure. The entire gambling network is licensed and regulated by the Lotteries and Gaming Authority of Malta (LGA). Should you encounter difficulties placing a bet, making a deposit or claiming a code free bonus, you can contact a customer support team. There's the option of a live chat facility, email, fax or telephone support, available daily from 10h00 to 22h00 Central European Time (CET). You can also browse through a comprehensive collection of FAQs, neatly arranged according to topic and available under the 'Help' tab. Mybet is a safe, secure and reliable cross-channel gambling site that readily accepts Canadians. There are thousands of bets on all the primary markets and if you're a football fan, you'll find more options than most. Bonuses are code free, promotions plentiful and there are live representatives to help you on your way. A mobile sports betting app appropriate for iOS and Android users is the cherry on the top but a no deposit bonus now and then would be a definite crowd pleaser.